Ben Mee admitted that visions of the Etihad, the Emirates, Old Trafford, Anfield or Stamford Bridge haven’t entered his head just yet when his head hits the pillow at night. Boss Sean Dyche’s mantra of approaching things “one game at a time” has certainly been adhered to by the squad in its entirety and that means they’re looking no further than the fixture against Cardiff City at Turf Moor this evening. The Clarets take a three-point advantage over second place Middlesbrough in to the midweek schedule with Aitor Karanka’s side hosting Huddersfield Town at the Riverside. And Mee is expecting a tough test when the Bluebirds come to town after they pushed themselves right in to the mix for the play-offs with a 2-1 win over Derby County. 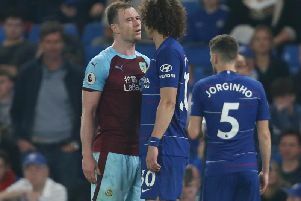 Following Burnley’s dramatic draw with Brighton at the AMEX Stadium, the defender said: “The mood is buzzing as it has been all season, especially over this second half of the season where we’ve been performing really well. There’s a great buzz around the squad. “There are seven big games to go. Everyone is really comfortable with the position that we’re in. A lot of the squad has done it before and it’s no different to what we were up against last time. “We don’t really talk about it (promotion) too much. We know this from being in previous situations so we don’t get ahead of ourselves. It’s one game at a time and we’re looking forward to the next one. While fans may already be dreaming of a return to the top flight, Mee accepts that the potential of playing Premier League football again won’t be a distraction for the players. “We are human but we can’t start thinking about other things,” he said. “You’ve just got to play every game as it comes and we are doing that really well – we’ve been doing that all season. Over the 16 game unbeaten run we’ve looked ahead thinking we need to win this one. “We just do it, we don’t think about it. That’s where that experience comes from. We’re drawing on that because we know things can change very quickly.